A few weeks ago, REI was advertising an event they were doing on New Year’s Eve. 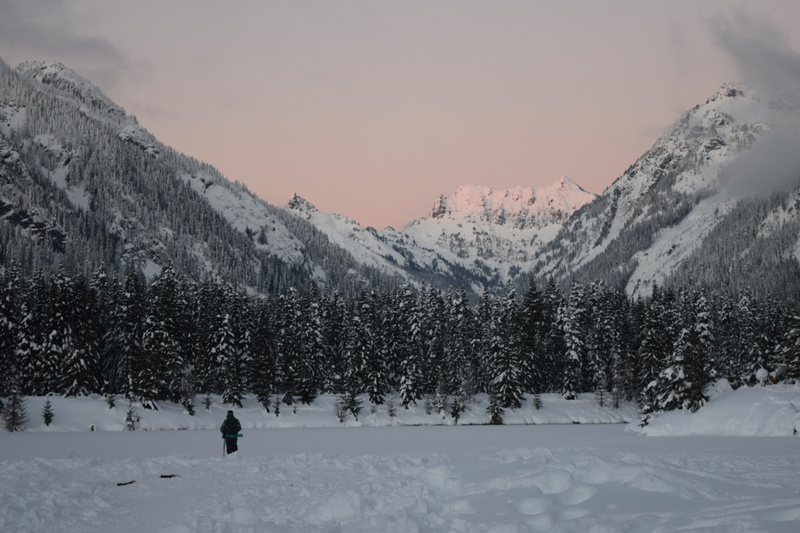 Their plan was to bring folks up to Gold Creek, have them snowshoe around the pond, provide food, lights, warming fires, and good cheer to welcome in the new year. It sounded so fun, but was expensive and sold out. My friend Cindy and I were discussing this trip, and thought we could do our own version. We’d plan to start a bit earlier in the evening, stay until dark, have some hot drinks, and be back home well before it was time to ring in the New Year. Aaron was willing to join us on this hike, and we were able to borrow snowshoes for him and Gabe (these kids keep outgrowing their gear!) We met at the trailhead at 3pm, just as the sun was moving behind the mountains to the south of I-90. The road to the trailhead was packed with cars along the north side. 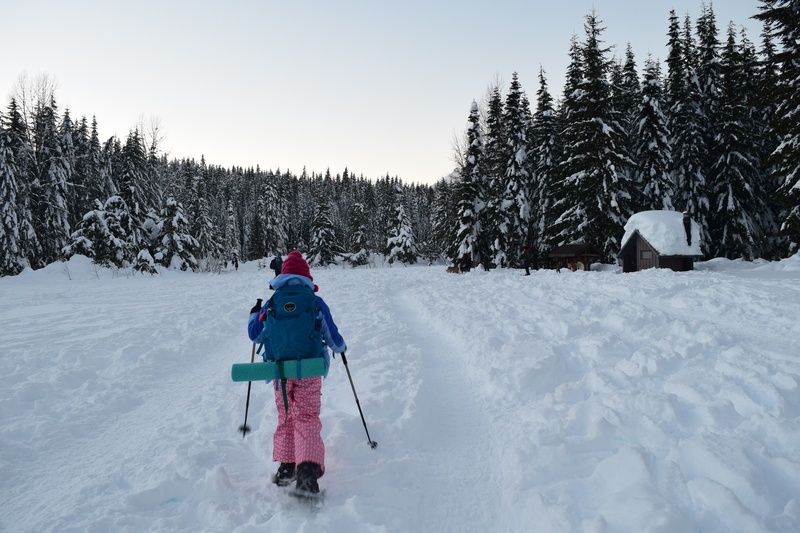 But it was late enough in the day that earlier snowshoers were finishing their walks, and we had no problem finding parking close to the trailhead. 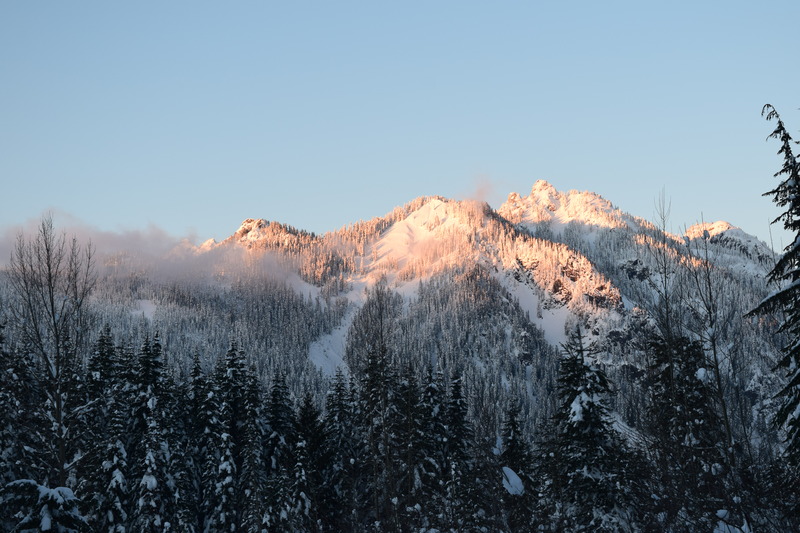 I made the mistake of using the porta-potties at the trailhead (do yourself a favor and go in the woods or up at the Snoqualmie ski area). It was brilliantly sunny and 23 degrees at the trailhead. One thing about this hike that I remembered was that the wind blows strongly while you are suiting up, chilling to the bone. But once you get on the trail, it’s generally sheltered from the wind. I recommend being as ready to go as you can be before you get there. 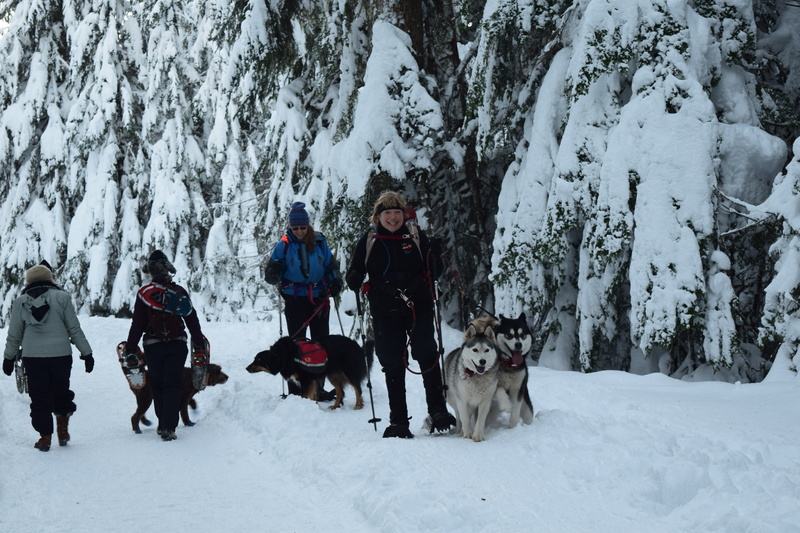 We headed up the trail with our friends and their dogs. It’s been over a year since we’ve hiked with our doggy buddies, and it was really nice to see them again. 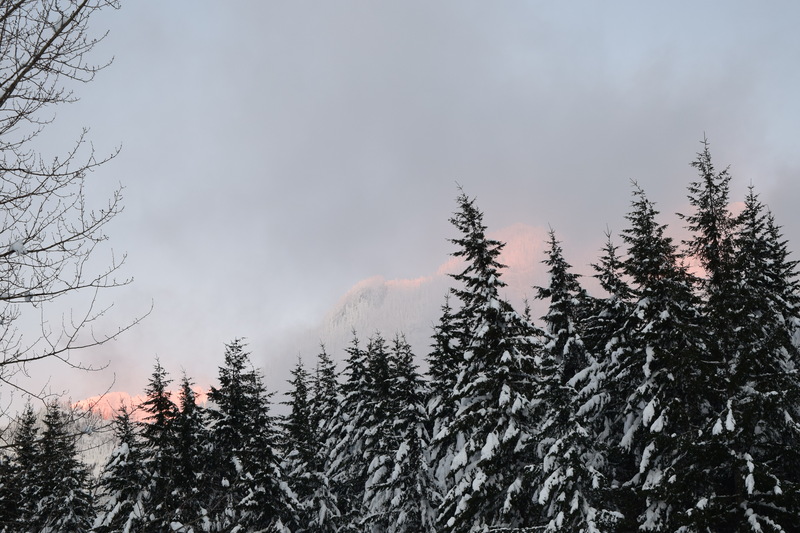 Snow clung to the evergreens in large clumps, reminding me of frosted gingerbread-house trees. 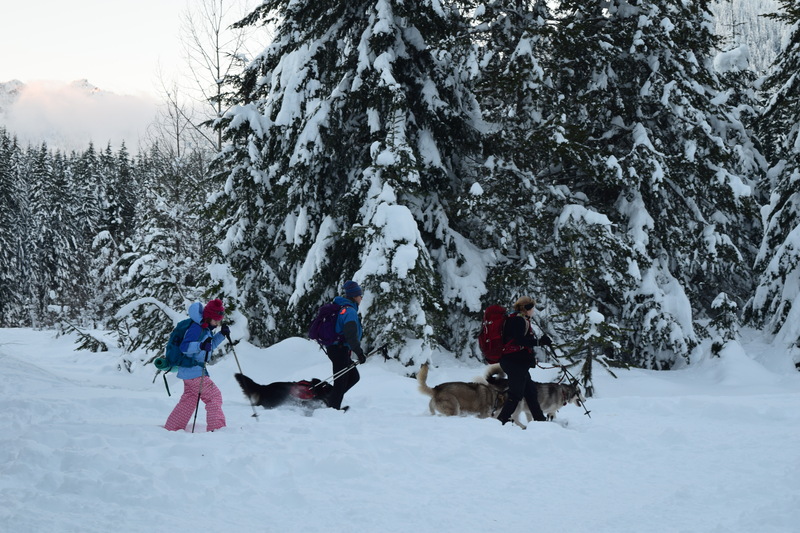 The snow was dry and powdery, packed down well for the trail, squeaky and crunchy. If we stepped off the trail, we sunk down deep. We admired the lake for a few minutes, did some wardrobe adjustments and took a drink of cocoa. 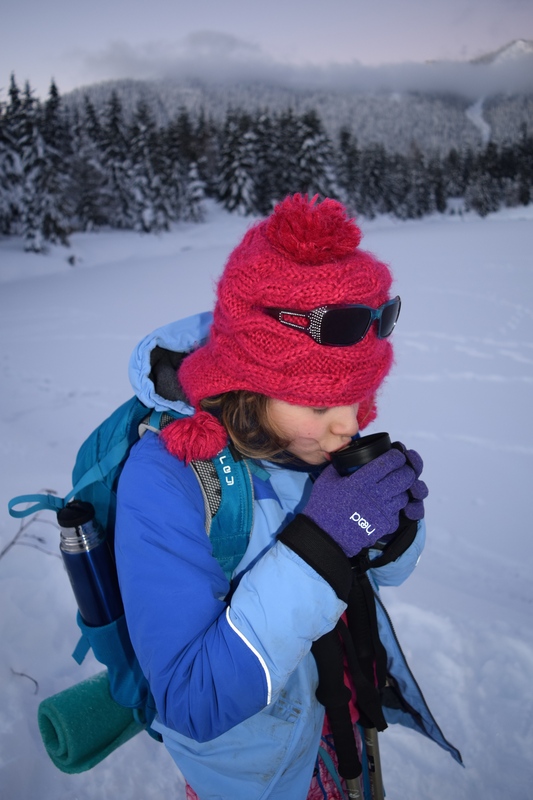 Members of our group who had hydration hoses found them to be frozen solid; the kids’ pop-up tops on their water bottles were also frozen shut. We continued clockwise around the lake. Annika and I straggled in the rear, both of us having issues with our snow pants constantly needing to be pulled up. Annika by this point was also needing some food; it was around 4:30 and felt like dinner time. But being at the end has its advantages: she spotted a snowshoe hare under a tree, and we watched as it hopped into better cover. We see their tracks whenever we go out in the snow, but this was the first time we’ve seen one of these white beauties. We caught up with Gabe and Aaron at the far side of the lake, where there was a spot that was all packed down for several people to sit and enjoy the view. I pulled out the snacks, enforced hydration among the troops, and we got our headlamps out. It was truly dusk by this point, and had gotten very quiet in the basin. Stars were beginning to flicker in the night sky. After our short break, we loaded back up and went forward to meet up with our T and C and the dogs. They had been waiting for us just over the next rise. We admired the view from there, and the doggies got their special lights attached. We continued onward over the 2 bridges, which were easier to do than I remember from the last time. 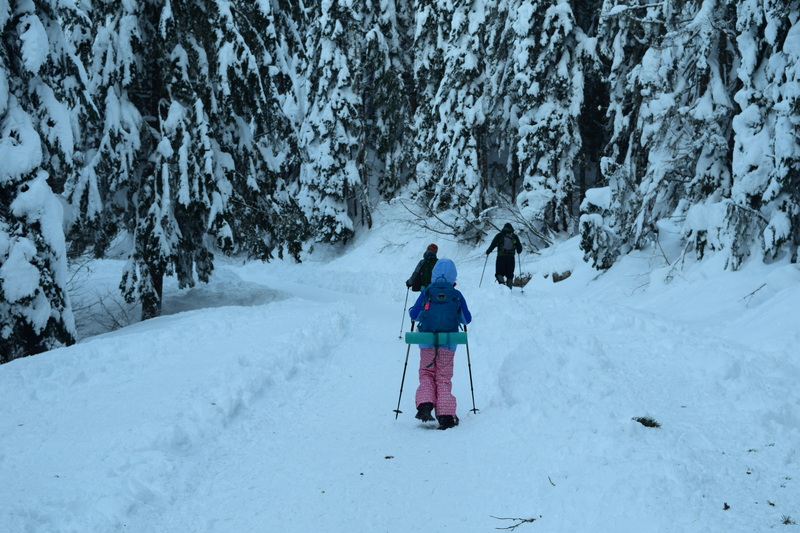 Just be careful not to let your snowshoes slip too far to the side, or you could be sliding down a long ways. By now it was truly getting dark. 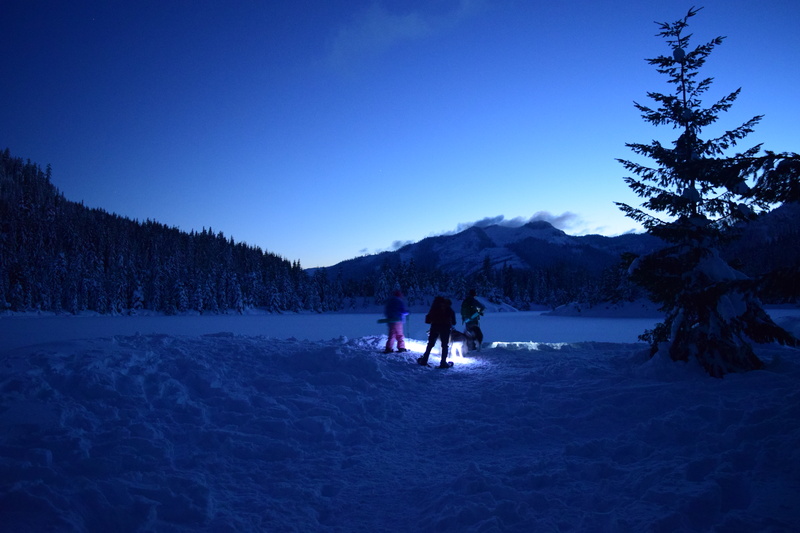 Frost was forming on our packs and coats, and ice crystals floated in the air, illuminated by our headlamps. The lights from the ski area at Snoqualmie were bright and warm, but the stars were blazing in the night sky. We made good time back to the beginning of the lake loop, and chatted briefly with the REI employees who were bringing some gear for their evening program. I thanked them for the inspiration for the idea to be there at night. We spent a few more minutes taking some last photos at the lake (Gabe wanted to set up the tripod and get some star shots). It was so frigid, though, so we couldn’t stay as long as he wanted. We trudged back down the road to the waiting cars. It was 18 degrees. We were ready to start getting warm, and headed home to end the day with pizza and a movie as we ushered in the New Year. This was an exhilarating hike! I’ve never been hiking at night in the snow before. It was a different world to be in, and I found I wished I could stay longer. The distance around the lake and back is just over 3 miles. There is approximately a 100 foot elevation gain. You will need a Sno-Park permit from November 1 – April 30. These can be purchased online and printed at home (they will mail you an official copy), or purchased from some vendors (find info on the Washington State Parks website.) 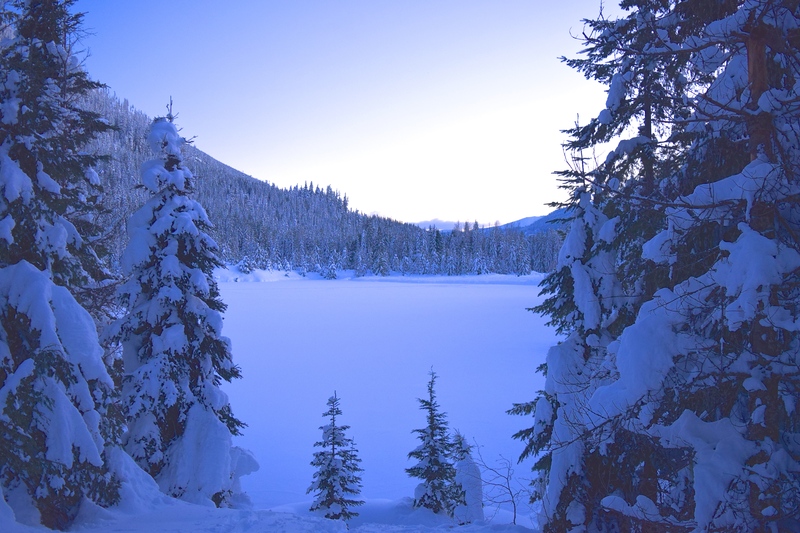 This is a very popular hike, and people also sled along the road to the trailhead, so get there early in the morning or later in the afternoon to make sure you get a parking spot. Don’t expect solitude on this hike. Once you leave the freeway interchange area and begin driving on the snow-park road, it is packed ice. It is drivable by normal cars, but go slowly and watch for pedestrians. Parking is on the north side of the road. I recommend turning around and facing west when you park so it’s easier to get out. Obey the signs telling you where NOT to park. 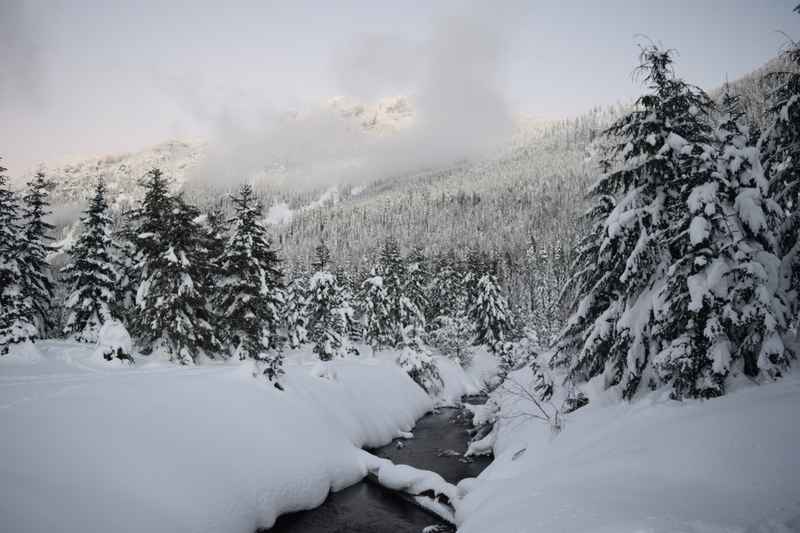 Though this is a generally safe and easy trail, there are more things to be cautious about with winter hiking than with summer. Please continue to bring the 10 essentials, and consider bringing a thermos of warm drinks and chemical hand warmers for little hands. Dress in layers, and continue to hydrate even though it’s cold. Chapstick, sunglasses and sunscreen are important on sunny days. Avoid wearing cotton and consider snow gear for warmth and protection. You could technically do this hike without snowshoes currently, since the trail is very packed down. But if for some reason you need to step off the packed snow, you’ll sink into the soft powder. If you’d like to read about our previous hikes here, see my trip reports from January 2013 and March 2013. Directions: Take I-90 east from Seattle up to Exit 54, just past the Snoqualmie Pass Ski Area exits. Head left (north) under the freeway, and turn right onto the frontage road, Forest Service Road 4832. (Be careful not to get right back onto the freeway like I did the first time.) Head east about 1 mile to where there is a bridge where a creek passes under the road to Lake Keechelus. You will see a snowy road on the left with porta-potties and signs for the Trail. Park along the north side of the road, either before or after the trailhead. 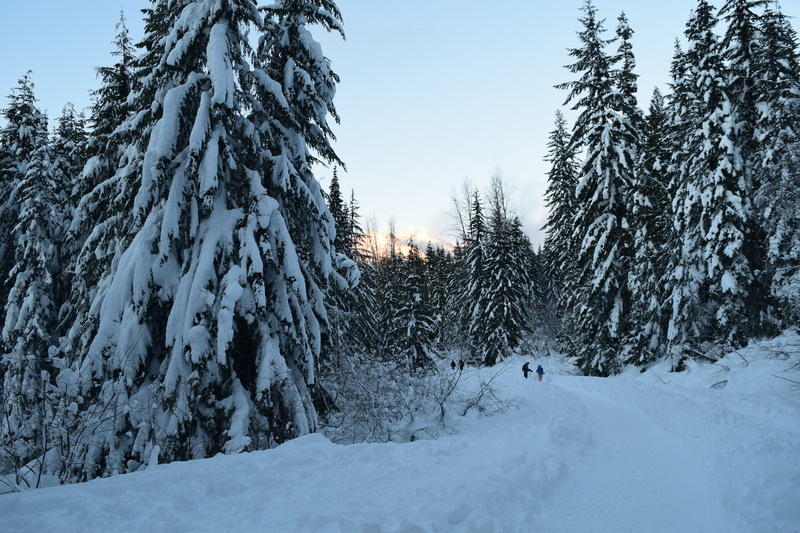 What a great way to usher in the new year – outdoors and with the whole family!